The new Idea Book is full of absolutely gorgeous, fabulous goodies! I LOVE every paper pack in there! We also have new bling, new stamps, and even fabric to coordinate with these fun papers! Click the above photo to check it out online. Contact me to get a hard copy of the Idea Book. Trust me, it will be love at first sight. 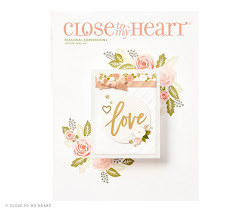 February is a great time to try Close To My Heart's online scrapooking program, Studio J. During the month of February, you can order a two page layout for just $5 (regular price $6.95). With Studio J, scrapbooking is as easy as uploading your photos and dropping them into layouts. 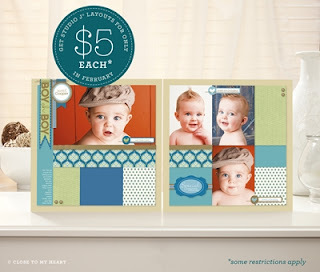 Choose Express collections for quick easy pages, or traditional layouts for more creativity. Click on the photo to try Studio J for yourself. You need to create a username and password to try it, but it's free to play. You only pay when you order your layouts. All new papers from the catalog are on there, as well as papers that are no longer available. If you are ordering, please click to add it to "March Club" to receive bonus product from me!